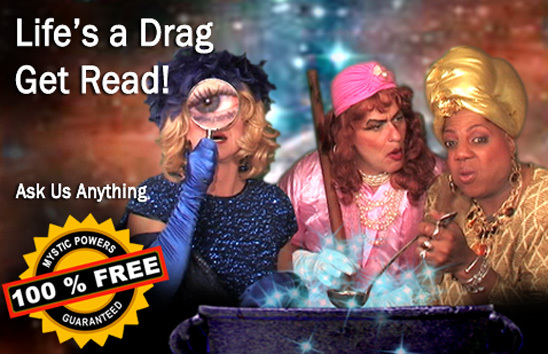 The Fabulous "MMM" Sisters' astounding array of Psychic Powers will amaze you! This Transational Trio can see into the future with blinding duplicity, providing vital information and guidance as well as making parking exceptionally easy. Channeling directly from their most recent engagement at the Seven Sisters Palace Hotel and Casino, the girls continue their urgent mission on earth where the imminent loss of polar ice is destabilizing the planet and worse still, melting Marva's makeup. Illuminating the darkest corners of the human mind, as well as numerous other parts of the anatomy, our Divas see what other psychics prefer to ignore, most assuredly with good reason. A virtual coven of chatty, triple eyelash wearin', soothsayin' fortune tellers with an alien edge - Get read today!